If you are an NLP or machine learning enthusiast and an intermediate Python programmer who wants to quickly master NLTK for natural language processing, then this Learning Path will do you a lot of good. Students of linguistics and semantic/sentiment analysis professionals will find it invaluable. Natural Language Processing is a field of computational linguistics and artificial intelligence that deals with human-computer interaction. It provides a seamless interaction between computers and human beings and gives computers the ability to understand human speech with the help of machine learning. The number of human-computer interaction instances are increasing so it&apos;s becoming imperative that computers comprehend all major natural languages. The first NLTK Essentials module is an introduction on how to build systems around NLP, with a focus on how to create a customized tokenizer and parser from scratch. You will learn essential concepts of NLP, be given practical insight into open source tool and libraries available in Python, shown how to analyze social media sites, and be given tools to deal with large scale text. This module also provides a workaround using some of the amazing capabilities of Python libraries such as NLTK, scikit-learn, pandas, and NumPy. The second Python 3 Text Processing with NLTK 3 Cookbook module teaches you the essential techniques of text and language processing with simple, straightforward examples. This includes organizing text corpora, creating your own custom corpus, text classification with a focus on sentiment analysis, and distributed text processing methods. 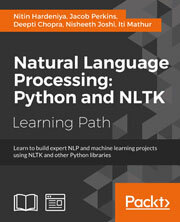 The third Mastering Natural Language Processing with Python module will help you become an expert and assist you in creating your own NLP projects using NLTK. You will be guided through model development with machine learning tools, shown how to create training data, and given insight into the best practices for designing and building NLP-based applications using Python. This comprehensive course creates a smooth learning path that teaches you how to get started with Natural Language Processing using Python and NLTK. You&apos;ll learn to create effective NLP and machine learning projects using Python and NLTK.